Here at Gilmont, camp isn't just about the crazy awesome activities. Our counselors are passionate about sharing the love of Christ with every camper! We hope that campers will grow deeper in the spiritual lives through morning celebration, Bible Studies, vespers, cabin devotionals, and the many conversations that occur at camp throughout the week. Our biggest desire is that God would truly transform the lives of everyone at camp. Kicks off every day at camp with some high-energy cheers, skits, and intentional time to introduce our Bible verse and study for the day. Counselors share their often funny and always engaging skits which they developed during staff training to help teach the lesson for the day. This is the time we all gather together to set the pace for the day in a way that is spiritually anchored and full of fun. 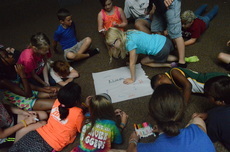 This is a time in the heat of the day for campers to come together in their family groups to discuss the daily theme. Each days theme ties directly to the overall camp theme. Bible Study is guided by a Spiritual Advisor and is in partnership with our counseling staff. This time begins with the scripture, a skit, time in which the group is broken into smaller groups to have a kinetic experience and involves using a variety of senses, and then a wrap up time so that the campers can share in their discoveries and to reflect on how this lesson affects their lives back at home. This happens each evening to close each day. We recap what we have learned through the series of activities throughout the day. This time allows the entire camp whether six years old or seventeen to come together under the stars and share and praise God under the great big sky! This is an opportunity for bonding together as a small group, reading God's Word, and learning more about growing to be more like Jesus. Each study is written by a Spiritual Adviser with scripture and thoughtful questions, and is led by a counselor, with the desire to help each camper grow deeper in his or her spiritual walk.